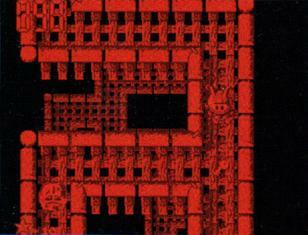 3-D Tetris would seem a natural fit for the Virtual Boy. Tetris is a Nintendo staple, and this system is specifically designed for 3D graphics. As you can guess, the blocks in this game are three dimensional and the player can manipulate them in a number of ways. 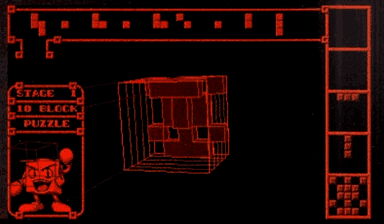 The Virtual Boy's ability to render 3D wireframe objects should make it easy for the player to tell what's going on. Well... no. You view the action from overhead, with the pieces falling into a square "well". In order to help you understand how the pieces are piled up, the camera is constantly roving around. It doesn't help that all the pieces happen to be red! Along the right edge of the screen are 2D cross-sections of the cube that act as visual aids. The fact that these are even necessary should indicate just how insanely non-intuitive this game is. Pieces fall extremely slowly, allowing the player all the time in the world to fiddle with each one to make sure it's going to fit in the right slot. It's remarkably tedious and about as fun as homework. The game forces you to perform a lot of visual contortions in your mind. Occasionally the bottom of the cube falls out for no apparent reason. After just a few minutes of 3D-Tetris you'll be like, "Oh my God, please turn this [expletive] off." 3D-Tetris will make your brain hurt and your eyes bleed. I don't recommend it. © Copyright 2014 The Video Game Critic. Not only is this one of the best titles for the Virtual Boy, but it may be the most innovative pinball game I've ever played! Galactic Pinball features four unique, well-designed 3D tables entitled Alien, Colony, UFO, and Cosmic. Each is loaded with cool targets, multiple flippers, and 3D mini-games. If you like those cool tubes and passages that run through many real pinball games, you'll really appreciate the ones that run both over and under these tables. The pinball actually looks more like a puck, but behaves just like a normal pinball would. The game's difficulty is just right and the variety of tables gives the game tremendous replay value. Complementing the sensational visuals is an excellent futuristic techno soundtrack. As icing on the cake, the cartridge saves all your high scores. Galactic Pinball is an amazing title for the Virtual Boy. © Copyright 2003 The Video Game Critic. 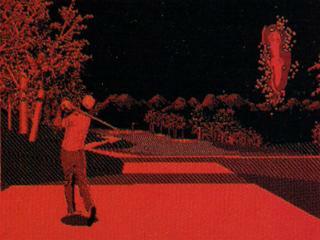 Golf provides some decent, fast-paced sports action, but let's face it - the Virtual Boy's red and black visuals don't lend themselves to the sport. The greens, fairways, and roughs are rendered in various patterns of red, and it's hard to tell them apart, which may be why I found my eyes getting a little dry while playing. Fortunately, you can always reference an overhead view of the course. The main screen steps you through setting your aim, club, and stance (for draw and fade). Swinging is done via two meters: Power and spin. The power meter is a moving arc, and the spin meter is a huge ball with a dot moving side-to-side across it. It's a pretty clunky interface compared to most golf games, but it does give you fined-grained control. After swinging you see an animation of a realistic-looking golfer hitting the ball, but if you look close, he really appears to miss it completely! Watching the ball in flight over the patchwork landscape is not easy on the eyes, so keep an eye on the overhead view instead. Golf isn't as user-friendly as most other Virtual Boy games, but despite a steep learning curve the game is enjoyable once you get the hang of it. Play modes include stroke (for one or two players) and a tournament mode where you compete against 48 CPU-controlled players. The cartridge automatically saves records and statistics to internal battery, but for some reason a password is required to save a game in progress. Golf features some nice digitized "crowd reaction" sound effects, and the music isn't too bad either (and you can always turn it off). There are plenty of other golf games I'd rather to play, but this isn't a bad way to spend a rainy afternoon. © Copyright 2004 The Video Game Critic. Besides the fact that it was one of few Virtual Boy games missing from my collection, I was really looking forward to playing Jack Bros. for its Halloween theme. This whimsical overhead platformer lets you assume the role of a ghost, pumpkin, or skeleton trying to reach a magic portal before midnight. The English version of Jack Bros. is rare and expensive, so I picked up the Japanese version instead (which wasn't all that cheap either). At first I regretted this decision because the game has a fun intro and plenty of dialogue that I couldn't read. In terms of gameplay however, Jack Bros. is not innovative at all and makes minimal use of the system's 3D graphics. In fact, I'm not sure why this game is even on the Virtual Boy! Each level offers a different set of stacked mazes sprinkled with wandering creeps, traps, and power-ups. There's some mild strategy here and there (like moving boulders to clear your path) but the action is basically limited to finding some keys and heading towards the exit. The characters are composed of stacked 2D sprites, but the illusion of 3D is modest at best. The Halloween theme isn't readily apparent either, thanks to the run-of-the-mill music and generic creeps. A password is provided between levels, but no score. Ultimately I'm glad I settled for the Japanese version, because Jack Bros. is definitely not worth breaking your piggy bank for. © Copyright 2008 The Video Game Critic.